Newly released data indicates that South Africa’s English Language Teaching (ELT) sector booked a third consecutive year of growth in 2018. Student numbers were down slightly from 2017, but, on average, students stayed longer, and this helped to drive total student-weeks for the year to an all-time high. These are among the findings in the latest data release from Education South Africa (EduSA), the country’s peak body for ELT. EduSA reports a total enrolment of 9,512 among its member schools in 2018, down 5% from 10,042 students the year before. Student weeks, however, rose nearly 5% to reach a new high point of 64,102 for 2018. This important shift in the composition of ELT enrolments in South Africa can be traced back to a November 2016 out-of-court settlement between EduSA and the South African government. That settlement ended two years of legal limbo where the country’s ELT providers were effectively kept outside of the student visa system. With the settlement, study visas could once again be issued for students enrolled with recognised ELT providers. 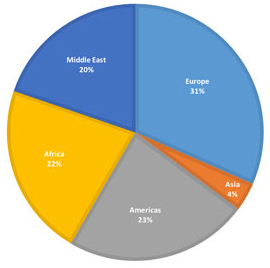 As the following charts reflect, South Africa has a fairly broadly based enrolment with strong representation from most global regions, with the exception of Asia. Europe sent nearly a third of all students in 2018, but accounted for only 25% of student weeks. African students, in contrast, represented 22% of all ELT enrolments in the country but those bookings also made up 30% of all student weeks. Student numbers for most global regions increased last year, with the exception of Asia, which fell off 6% and Europe, where enrolments declined by 26%. EduSA attributes part of that European drop to a looming water crisis in South Africa last year, which was widely covered in European media. In contrast, enrolments from the Middle East jumped up 20% in 2018, marking it as an increasingly important growth market for South African providers. 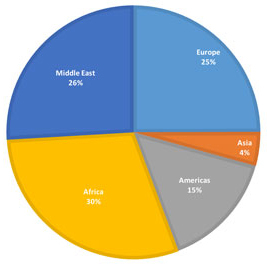 Finally, EduSA reports a growing interest in general from a widening range of sending markets. “Agents have indicated that prospective students are asking for ‘something different’, which is exactly what South Africa has to offer the ELT marketplace,” says Mr Peters. The EduSA data indicates that agents referred roughly two thirds (65%) of all ELT students to the country in 2018. This entry was posted in Africa, Language Learning, Regions, South Africa and tagged Education South Africa, international students in south africa statistics, studying abroad in south africa, number of international students in south africa, international students in south africa.